1) Do give us a little background info. Who are in your family? Any close friends? I grew up and still live in Ottawa, Ontario, Canada – the capital of the country and a big small town. Ottawa may be perceived as one of the most boring places, but has all kinds of gems if you’re willing to dig beneath the surface. I live here with my husband-to-be and my black cat, Kiri. These two are my key support team: one provides the food and hugs, the other keeps me in my place. It’s an essential balance for my productivity. When I need a break from Kiri’s tyranny, I spend time with the rest of my family, which seems to keep growing as we all find partners and produce smaller versions of ourselves. 2) You write fantasy mostly. Any reason you picked up the genre? Any plans to write in other genres? I didn’t start out writing fantasy. When I was in high school (no, these books are not and never will be published), I focused mostly on literary fiction – the heartwarming, soul-crushing tales one expects to find in Canadian literature. I made the switch as late as my last year of university when I had an idea for an urban fantasy series, and somehow never went back. Even when I get an idea for something NON-fantasy, the story seems to shift. Why? I think because it’s so much fun. I write to escape as much as I read for the same reason, and fantasy has that element of escapism like nothing else. The idea of magic being possible, of dragons being real, of mythology coming to life – to heck with reality and bills and responsibility, I want to be THERE. My goal is to create worlds that offer people that same escape. While all of my future projects are solidly cemented in fantasy, I am playing with subgenres. My published trilogies play with epic tropes, while I have an urban fantasy series and a gothic fantasy standalone in process. 3) Can you tell us one event in your life which has had the biggest influence in making you the person you are today? Ohh, now there’s a question. I think I could pin a lot of my interests/personality/career down to picking up Marion Zimmer Bradley’s The Mists of Avalon for the first time. I’d read other fantasy novels before then, but her way with words, her beautifully crafted settings and plot drew me into that world of magical realism and gothic beauty. Women were confident and played important roles in guiding how their society worked, and that inspired me. I wanted to be just like them – confident, mysterious, powerful. Sure, I was twelve at the time and have now given up on being most of those things – especially mysterious; my life is more or less an open book – but I still find myself falling into that mindset when it comes time to plot out a new world. 4) Tell us a bit about the world in which your books take place. My current trilogies are set in a pseudo-mediaeval country called Andvell. It’s a monarchy that has reached a level of economic success after a lot of drama with a mad king and on the surface seems stable. But just like any fantasy world, the undercurrent of magic causes all kinds of problems. In the first trilogy, Meratis, magic inadvertently wakes up a dragon that terrorises the southern half of the country. A mad sorcerer aims to take power, and one family summons the author of their drama into their world to help them sort out their problems. Of course, the author (from our world) has no idea what to do about a dragon, let alone how to hold a sword, so shenanigans ensue. In my second trilogy, Cadis, the world opens up to include Margolin, a country to the east that’s come under hard times with a poisoned queen who becomes deranged and declares war on Andvell, and Cordelay, Andvell’s southern neighbour that was hard hit by the mad sorcerer and is trying to rebuild while faced with these new challenges. A sassy, sharp-tongued assassin becomes all that stands in the way of these countries’ destruction. While the story is solidly fantasy, the language is relaxed and closer to ours. The characters are mostly people trying to find their place among the chaos. 5) All you covers are very beautiful. Are they all done by the same artist? How did you find him/her? I adore my covers. I was lucky enough to work with two different artists who understood my own lack of artistic knowledge and turned my feeble concepts into works of art. The Meratis Trilogy was designed by Kevin Lester who worked with my faint concepts from scratch and turned them into these brightly coloured, eye-catching pieces. Jeff Brown (Jeff Brown Graphics) helped me with The Cadis Trilogy and really brought the epic feel. They were both recommended to me by an author friend and I’m so pleased that I had the opportunity to work with them. 6) As an indie author, you are your own boss. Do you spend more money in marketing the book or in actually creating it(editing, cover etc)? These days, I would say I spend it more on creating. I want my editor and cover art to be the best they can be for the better quality book – both of which go a long way to marketing themselves. When I first started out, I bought a bunch of ads that didn’t offer a good return, so I’m trying to learn new ways to promote my work and save my budget for the methods that have the greatest return. 7) Can you tell us about your ups and downs in publishing? Any mistakes you made early on/recently? The Cadis Trilogy has been my steepest learning curve. With Meratis, my mentor walked me through the steps and I learned a lot about the publishing process. Also, that was in 2013, and the publishing world has already changed significantly in the last three years. With Cadis, when the first book, Bloodlore, was first released, I was going through some family issues and didn’t put much effort into promotion. As a result, it was a challenge to gain momentum with the series. Now that the last book of the trilogy is set to come out next month, I’m planning a bit of a relaunch. 8) How many drafts do you do of a novel? How long does it take to get one done? Thanks to NaNoWriMo, I’ve started giving myself 30 days to write first drafts. The outlining/brainstorming can be an on-and-off process for a few months before that, but once I start, I go until it’s done. For edits, it took a lot of books to find a process that works well for me, but at the moment I use alpha/beta readers and a professional editor. Between all the various passes/edits/proofreads, I would say I go through each manuscript myself 12-13 times before release, which usually takes me about 4-5 months. At the moment I’m two books ahead on my urban fantasy series, so that timeline will be stretched out so I can finish as many as possible before I start releasing them in the second half of 2016. 9) If you were starting today as an indie, how would you go about it? I would read a lot about indie pubbing before starting. There are so many nitpicky details that wouldn’t have occurred to me until I ran into them, but there are many great resources out there that take a new author through the step-by-step. I’ve started reading a minimum of one craft book a month and each book gives me a new understanding of where the industry sits today (which might be completely different tomorrow). 10) Tell us about your favourite books? Movies? Lately I’ve been binging on Agatha Christie as something light and quick to keep me entertained during edits, but at heart I’m an Austen girl. 19th century British fiction is my one true love…which is why writing fantasy also strikes me as a strange decision. Although my favourite book of all time is the underappreciated piece of Canadiana “The Blue Castle” by LM Montgomery, the same author that brought Anne of Green Gables to life. This book is all about living your life in ways that make you happy – it’s cynical, heartwarming, funny, sweet – I read it at least once a year. When it comes to movies, I’m in a lull right now. My favourites are still Tim Burton’s peak films, like Sleepy Hollow. Peter Jackson’s LotR trilogy is up there as well for the details and aesthetic. Beautiful films. 11) What are you working on now? I’m split between a couple of projects at the moment. The first is the final book of the Cadis Trilogy, Bladelore, which wraps up the tale of foul-mouthed assassin Venn Connell as she tries to stop a war from tearing her country apart. It’s gritty and full of dark magic. Venn is probably one of my favourite characters to write to date – she’s got a lot of depth and confusion and doesn’t really know where she sits in the world. I’m also working on my new urban fantasy series, The Invisible Entente, which began as an urban fantasy/cozy mystery novella (which is still available for free to my newsletter subscribers, but only for a few more months – http://eepurl.com/GIJkz) and spun into a full series. Each character is a modern-day descendant of a mythological figure, such as Morgan le Fay, Medusa, and Robin Hood among others. I’m very excited about this series and can’t wait until I can talk more about it! 12) Anything you would like to add? I love meeting new people on social media! Talking shop and engaging with readers are some of the highlights of an otherwise solitary job, so feel free to come and find me and introduce yourself! Thank you so much for the chat A.J. – it was great fun! A. J. Chaudhury is a young author from India writing mostly in the fantasy genre. His historical low fantasy short “A Song of Blood” releases shortly. 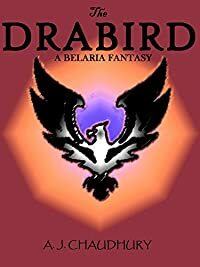 Click here to download his fantasy novella “The Drabird” for free. Thanks very much for inviting me for the q&a!